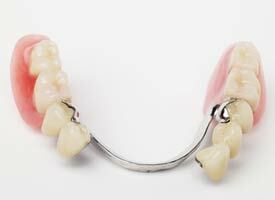 A removable partial denture (RPD) is indivdiually designed to specifically meet your personal needs. The benefit of the RPD is that it can replace multiple missing teeth. A natural appearance and speech clarity is restored along with the ability to eat more efficiently. The greatest advantage of an RPD is cost. It is usually the most cost effective option to replace multiple missing teeth in an arch. While they do move, most RPDs can be designed to limit that movement. They do; however, remain removable. Partial dentures are fabricated with a metal framework and processed with pink acrylic supporting the denture teeth. A patient’s specific needs, remaining teeth and anatomy dictate the design of the partial denture and every effort is made to utilize esthetic designs that hide the necesary metal framework while the partial denture preserves the remaining teeth and supporting oral tissues. Dr. Sharifi will design your partial denture so that the chewing forces are evenly distributed over the entire surface of the remaining teeth and soft tissue bearing areas. Alterations to your remaining teeth will be necessary when you wear an RPD.